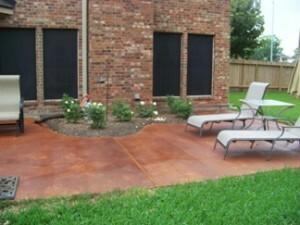 Brooks Concrete offers a variety of concrete design elements for your outdoor living areas. Do you have an old slab patio that has seen better days? 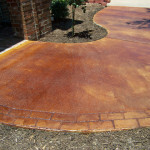 We offer custom etching and staining to bring beauty back to that old concrete. This is truly the best bang for your dollar. Staining is durable, long-lasting and adds that custom touch at a fraction of the cost of other alternatives. We work with you to add interesting design characteristics to your sidewalk, driveway or walkway using brick, natural stone and interesting etching. Flagstone is another beautiful and durable alternative to wood decking or concrete patios. It is long lasting and gives added value to your property. 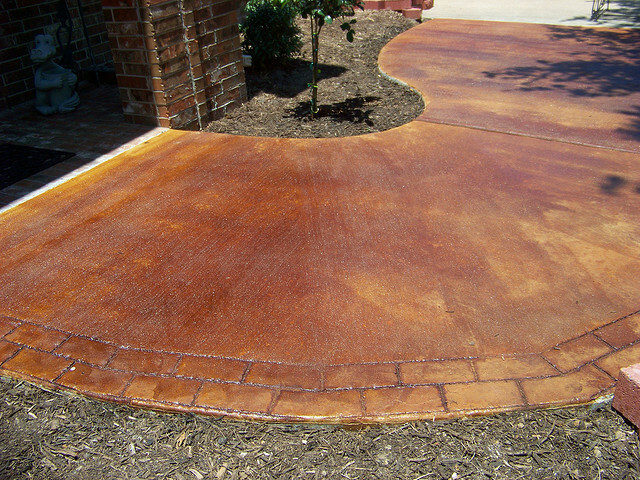 Beautiful rust colored brushed stain on the back patio of a new home before landscape plantings.